Naina Devi Temple is a holy shrine that is dedicated to Shri Naina Devi, one of the forms of Goddess Shakti. 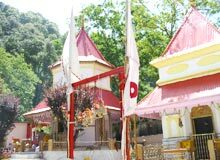 Located on the top of a hill in Bilaspur district of Himachal Pradesh, Naina Devi Mandir is one amongst the fifty one Shakti Peeths. The Temple of Naina Devi is a famous temple, connected to the National Highway No. 21 for the facility of pilgrims. The hill can be reached through a road by vehicles and to reach the summit, one can opt for concrete steps or cable car.